Click the image above to view a PDF of this story. A boost in sales, a crowd in the store, lots of goodwill toward your business—there are many reasons why you might host a special event. These events offer a great way to bring the community together with your business front and center. But they’re also a lot of work. A successful event, regardless of the size, requires careful planning and attention to detail. A half-hearted attempt that results in chaos on the big day may do more to embarrass your business than advance it. So how can you make sure you’re ready? The details will vary according to your specific plan, but if you want to survive your first or 50th event, you should follow a few guidelines. 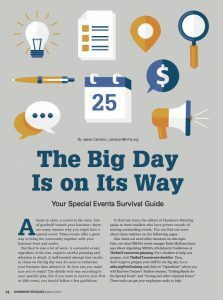 To find out more, the editors of Hardware Retailing spoke to three retailers who have proven records of hosting outstanding special events. You can find out more about these retailers on the following pages. Also check out some other resources on this topic. First, see what NRHA’s event manager Katie McHone-Jones says about organizing NRHA’s All-Industry Conference at TheRedT.com/event-planning. For a timeline to help you prepare, visit TheRedT.com/event-checklist. Then, don’t forget to prepare your staff for the big day. Go to nrha.org/FreeTraining and click on “Operations” where you will find two Trainer’s Toolbox lessons, “Getting Ready for the Special Event” and “During and After a Special Event.” These tools can get your employees ready to help. Dustin Wilkins is the assistant store manager at Rocking R Ace Hardware in Harrisonburg, Virginia. He holds a biannual power tool tent sale that includes his major power tool vendors, a customer appreciation dinner and crowds of mostly pro customers. For the past three years, Wilkins has also helped organize a ladies’ night around Christmastime. The event has grown in popularity and includes door prizes, how-to demonstrations and food cooked fresh on the grill. He also gets participation from other local businesses. 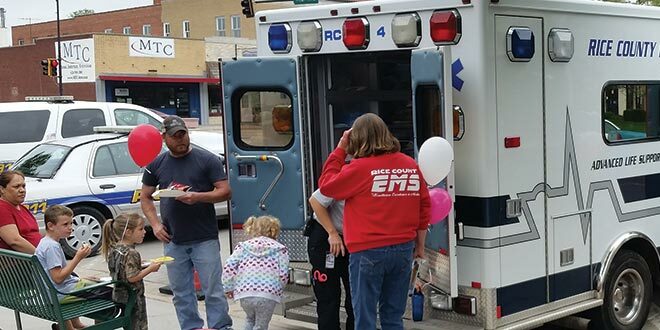 The signature event at Woydziak Do it Best Hardware in Lyons, Kansas, is a children’s safety day. Owners Jason and Danica Huddleston, who have four children, hold the Safety Day at city hall across the street from the store. With the assistance of local law enforcement, children create free IDs and discuss important topics such as not talking to strangers and bullying. A couple of years ago, the Huddlestons also agreed to pay for and organize the town’s annual Christmas parade when the city could no longer fund it. 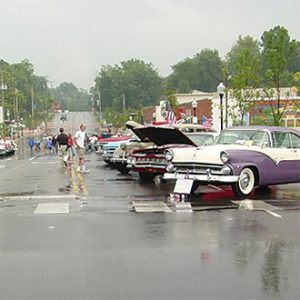 Nearly 13 years ago, Mike Unterreiner, owner of Hartman Hardware in Shawnee, Kansas, wanted to create a way for members of the community to show off their classic cars. He put his organizing skills to work, and today, the Wheels & Dreams Car, Truck and Bike show draws more than 350 cars and 3,000 car enthusiasts. Unterreiner gets a permit from the city to shut down the street in front of his store and gets sponsors from nearly all the downtown businesses. It has become a big boost to local commerce. Every event should have a purpose and you should be able to clearly define it. Whatever your goal, choose something that will get you and your staff excited. The Christmas parade is only one of the many events the Huddlestons coordinate. 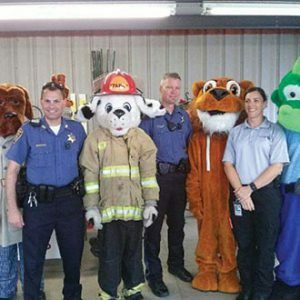 One of the largest is a safety day, which is designed to promote child safety in the community. In fact, nearly every event they organize is in some way centered around children. “The biggest key in having a successful event is finding what you are passionate about,” Jason says. As parents of four children, the Huddlestons understand the importance of offering family-oriented activities, but they also have a larger picture in mind. Try summarizing the goal for your event in a sentence or two. Is it clear enough that everyone on staff can easily understand what you are trying to do? You’ll also want to make sure your event makes sense with your customer base. For example, you might want to simply say thank you to your customers for their business, you might want to promote a particular department in your store and drive sales, or you might be helping a local nonprofit raise money. With a clear goal in place, you can make sure everything you do for the event works toward it. If anyone knows how complicated a large event can be, it’s Unterreiner. For the past 13 years, he has been on the planning committee for his town’s annual car show. He begins several months before the event taking care of getting sponsors, scheduling entertainment and ordering trophies for the winners. But it didn’t start that large. As one of the founders of the event, Unterreiner needed some time to learn the demands of handling a large crowd. If you’re tackling your first event, start with something simple. You will learn from your mistakes and successes and build from there. One easy way to go too big too fast, for example, is with sale items. By offering merchandise at a discount, you can draw a crowd, but overspending is counterproductive. 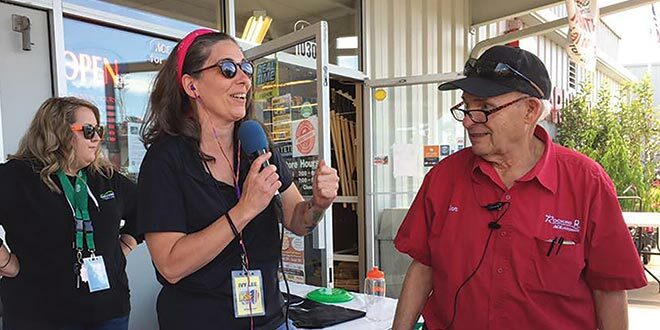 The tool show at Rocking R Ace Hardware includes a local radio personality to add excitement to the event. Once you’ve established your goal, organization is your biggest asset. 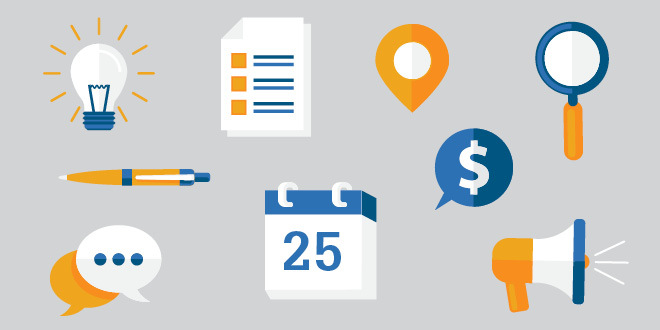 Depending on the scope of your event, you might start planning four to six months in advance. When planning their children’s safety day, the Huddlestons start by choosing a date. While you can’t work around everything going on around town, it’s best to avoid big events that could divert your audience. Even if you don’t think another event in town will conflict with yours, it may be big enough to cause road closures (for example, a 5K race that runs through town). Even if your customers don’t go to the race, it could still make it more difficult for them to come to your store. Once the date is established, you can schedule services you need from businesses outside the store, such as entertainers, caterers or your vendors. You’ll also need to consider permits or licenses. For Danica, that means purchasing special event insurance (which she needs since she is conducting the event off-site) and contacting a local radio station so they can be present for a live broadcast. Call local authorities for any permits or inspections you may need. For example, if your event involves shutting down a city street or serving alcohol, as does Unterreiner’s car show, you will need to get the appropriate permits from city departments. When appropriate, ask store vendors to attend. They are likely to jump at the chance to show their new products, and they may provide giveaways. Having brand-name vendors your customers recognize at your event also lends credibility to your business as the home improvement experts in the area. 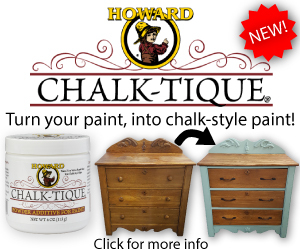 Having a vendor in attendance is also a great way to introduce a new product. Don’t try to tackle the entire event on your own. Consider delegating responsibilities to other employees according to their strengths. Wilkins has taken on much of the responsibility of organizing the store’s annual tool sale for several years, and now he’s finding others to help. 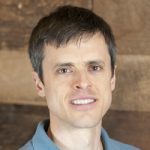 “I know what needs to be done in each phase of the process, so I can match it with the talents of the people on my team,” he says. Put a talented organizer on your team. The planning phase will involve making a to-do list, so you want someone who is thorough and will follow through until every task is finished. If you keep good notes, doing it the next time will be easier. When you get employees involved, they will also take ownership of the event. When that happens, they are more likely to be excited about it and pass that excitement on to your customers. Woydziak Do it Best Hardware’s safety day, held at City Hall across the street from the store, introduces children to local emergency responders. If you’re going to throw a party, make sure you let everyone know. Having a well-rounded marketing plan is essential if you want to draw a crowd. In the weeks leading up to the big day, the store should look as if something is about to happen. Hang posters or banners advertising the event. Create bag stuffers cashiers can hand out at checkout. Most importantly, get employees to talk it up. Personal invitations will be the most effective way to get people to put your event on their calendars. And customers are more likely to be excited about the event if employees are. But the best way to get employee buy-in is to keep them well informed about the details so they can answer customers’ questions. Use every type of marketing available to you, including radio spots and targeted email marketing. But next to personal invitations, social media could be one of your most powerful assets. Facebook also presents unique opportunities during the event. Wilkins had an employee shoot a Facebook Live video at Rocking R Ace’s last ladies’ night. That video and the photos he posts during the event help generate interest among people who didn’t attend and may be interested next time. The social media content also gives him material he can use to promote the event in the future. More than likely, other local businesses would be interested in being a part of a special event, so consider creating some partnerships. 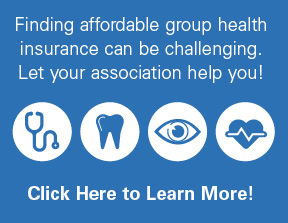 Look for ways other businesses can participate. 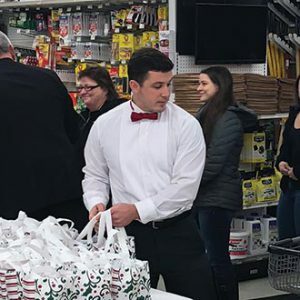 At the ladies’ night at Rocking R Ace Hardware, Wilkins invites other local businesses to share their products and get involved in other ways. 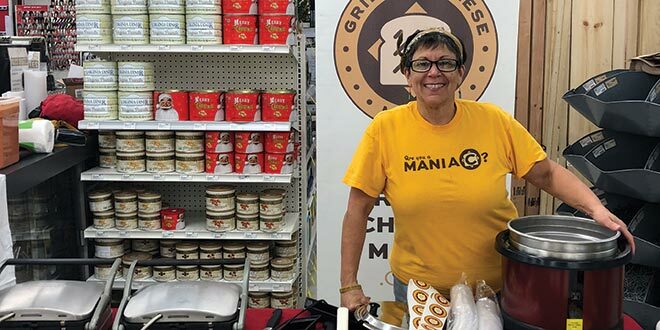 Last year, a local coffee shop brought in coffee, a bagel shop donated desserts and a food truck made grilled cheese sandwiches. When other businesses participate, they will likely promote the event ahead of time to their customers, which is not only free publicity for you, but gives your business exposure to a new set of customers. In addition, partnering with other small businesses in your area strengthens your buy-local message. 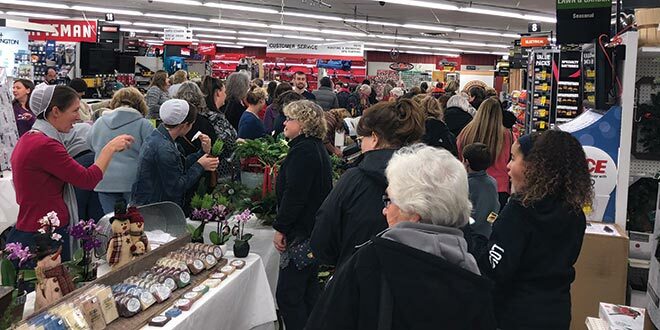 The ladies’ night event at Rocking R Ace Hardware includes local vendors who offer samples of their food. When the event is over, your work isn’t done. If you want to plan effectively for the next event, learn from your mistakes and successes. Don’t wait until next year to reflect on your event’s success. Do it right away. A day or two after your event, while it’s still fresh in your mind, gather your employees and talk about it. Save those notes for the next time you host the event. And listen to everyone, including staff, business owners who partnered and customers, during the event or later when you see them in the store. The most beneficial part of evaluation is finding problem points and fixing them, especially if your event is new or you’ve not had much experience running one. 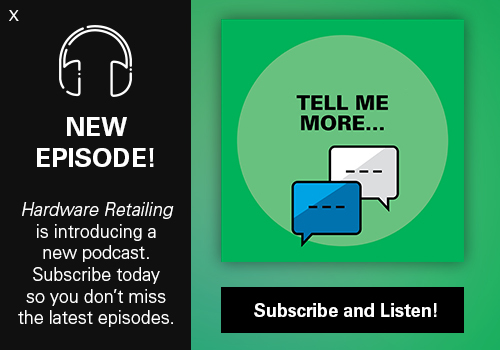 Think through every detail and ask questions such as: Were we able to get customers through the registers quickly? Was there enough parking? Did we have enough food and giveaways? Look for solutions and don’t be discouraged if it takes a few times to get it right. If customer interest is low and the difficulties outweigh the successes, don’t be afraid to stop hosting a particular event. Know when it’s time to move on and try something else. Especially for events that revolve around sales, it may be easy to emphasize dollars rung up at the register. However, that isn’t the only true measure of success. It’s difficult to measure the residual effects of having a large group of people excited about being at your business. There may be increased awareness about a particular product or department or increased customer loyalty because of the good time people had. Look for new faces in the crowd and work on building relationships. The goodwill generated will stick with your customers long into the future. Your event may have gone well, but that doesn’t mean you should do it exactly the same way next time. Getting stuck in a pattern could mean it loses its energy. The Huddlestons’ safety day has been very successful and continues to grow. Still, Jason looks for ways each year to try something new. At Rocking R Ace, Wilkins found he needed to make a few alterations to the store layout to help managing the large crowd at ladies’ night.